On June 25, the Olimpiisky Sports Complex will host another concert of the classics of the "new wave of British heavy metal" Iron Maiden. The winning cancer is amateur pilot Bruce Dickinson, the gray cardinal bassist Steve Harris, who has been in control of the band for many years, and their friends have had a strong influence on the world. 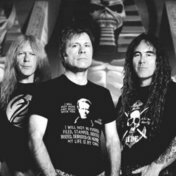 We have collected eight tracks that emphasize that Iron Maiden forged riffs can be used in a variety of genres - from heavy alternative rock to indie and even relaxing r'n'b. Listen to the collection 8 tracks with samples of the Englishmen Iron Maiden in high quality, absolutely free. You can listen to the whole collection, or separately song by song. In addition to 8 tracks with samples of the Englishmen Iron Maiden of the collection, you can find any other one by following the link and get information with the already collected collections and collections of tracks, songs and music.